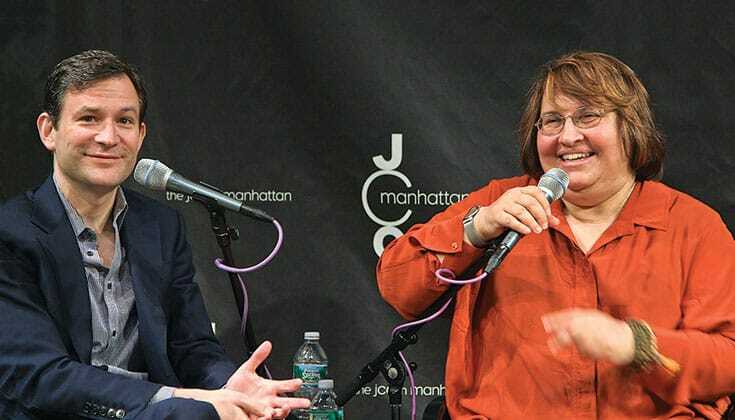 Facing her suffering head-on has made Sharon Salzberg one of today’s most relatable Buddhist teachers. Lindsay Kyte talks to Salzberg about her difficult life’s journey, establishing loving-kindness as a key practice in American Buddhism, and how we can all find real happiness. 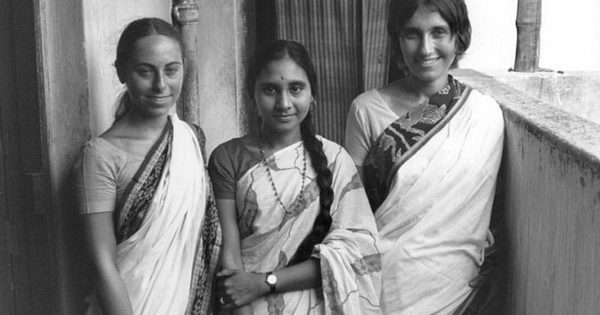 Salzberg (right) in India in 1972 with Dipa Ma’s daughter, Dipa Barua (center), and IMS cofounder Jacqueline Mandell Schwartz (left). Photo courtesy of Insight Meditation Society. 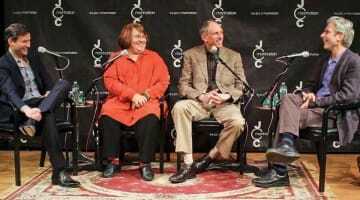 Sharon Salzberg knows suffering. At age nine, she was dressed in her Halloween ballerina costume, watching Nat King Cole on television, when something went horribly wrong. Her mother started bleeding violently and was whisked away amid the panic of flashing ambulance lights. That was the last time Salzberg saw her mother, who died two weeks later. Salzberg was sent to live with her grandparents, and when she was eleven her estranged father appeared—a troubled, dishevelled stranger who told her, “You have to be tough to survive life.” Six weeks later, he overdosed on sleeping pills, and for the second time, Salzberg watched her parent being rushed away by ambulance. Her father was never to function outside of the mental health system again. The adults in her life never talked about loss or grief, and Salzberg learned that silence meant safety. Little did Salzberg know that someday, plunging into the heart of her suffering would be her greatest teacher—and make her the renowned Buddhist teacher she is today. When I ask her where that sense of possibility came from, Salzberg shrugs. “That is beyond me,” she laughs. Salzberg at IMS with insight teacher Anagarika Munindra, who told her, “The Buddha’s enlightenment solved the Buddha’s problem — now you solve yours.” Photo courtesy of Insight Meditation Society. Salzberg had no idea what he meant. It was the first sign that this would be a journey beyond anything she had ever experienced. Arriving in India was scary. Salzberg writes that she had “never seen life displayed so openly before, with joy and suffering all jumbled together. Nothing seemed hidden, and there was nowhere for me to hide.” However, her quest to find a teacher proved fruitless until she heard Daniel Goleman, later the bestselling author of Emotional Intelligence, mention a meditation retreat in Bodhgaya. The ten-day retreat was led by S.N. Goenka, a former Indian businessman and famed teacher of vipassana (insight) meditation. He told the participants that the point of the practice was to see, and free themselves from, old patterns. Salzberg was surprised at the emotions that began to surface. 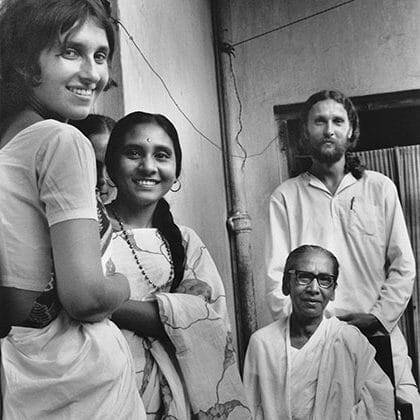 “An incredible love would come forth from her”: Sharon Salzberg (left) about her teacher Dipa Ma (seated right). Photo courtesy of Insight Meditation Society. Salzberg found a sense of community among her fellow seekers. 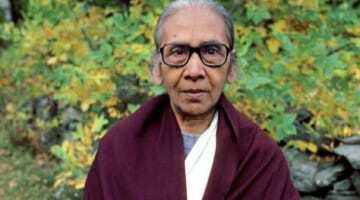 That famed Goenka course included many Westerners who would become leading figures in the growth of Eastern spirituality in the West, including Ram Dass, Joseph Goldstein, Jack Kornfield, Mirabai Bush, Krishna Das, Dan Goleman, and, of course, Salzberg herself. 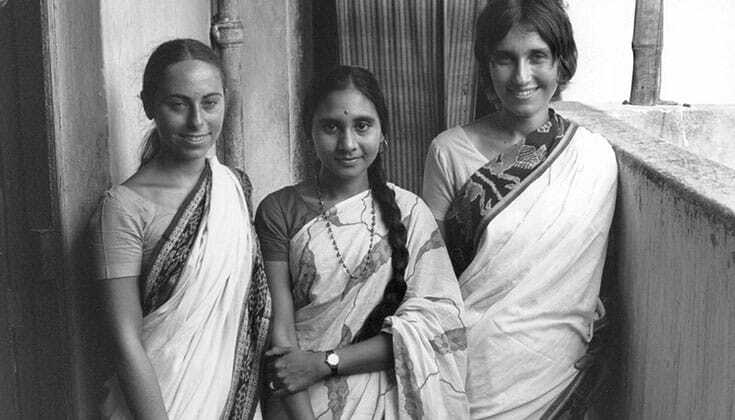 Salzberg was twenty-one years old when she returned to the U.S after four years in India. 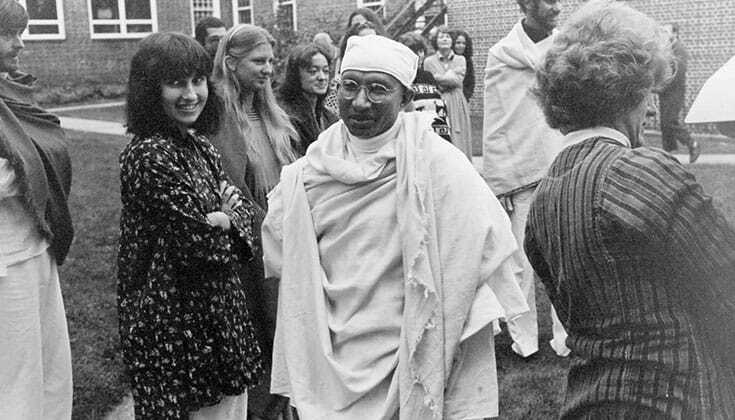 There she joined some fellow meditators from the Goenka retreat who were teaching at Naropa, creating an informal community that would produce some of the most recognizable and influential names in American Buddhism. 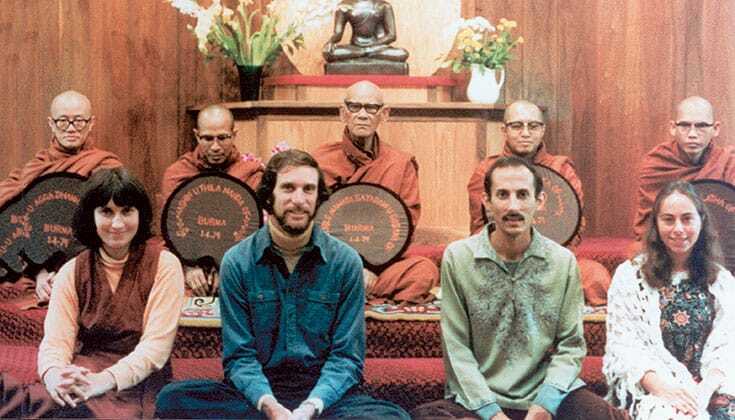 Burmese Vipassana master Mahesi Sayadaw (back row center) conducts a teacher authorization ceremony in 1979 for IMS founding members Sharon Salzberg, Joseph Goldstein, Jack Kornfield, and Jacqueline Mandell-Schwartz. Photo courtesy of Insight Meditation Society. Salzberg says she took refuge from her fear in a kind of dogmatism. “I would quote things from the teachings as though they were my personal direct knowledge, rather than just saying, ‘This is my understanding of what the Buddha said.’ I had to take a big journey in terms of teaching.” It was only when she decided to talk about metta that she began to find her true voice as a teacher. Salzberg and her friends began teaching and leading meditation retreats all over the country, sleeping on couches or floors. Then someone said, “Why don’t you start a retreat center? It would be a place where the energy of people practicing together doesn’t dissipate at the end of the retreat.” So Sharon Salzberg, Joseph Goldstein, Jack Kornfield, and Jacqueline Mandell-Schwartz founded the Insight Meditation Society, one of the most important institutions in Western Buddhism. They found a former Catholic novitiate on eighty acres of land in Barre, Massachusetts, that was for sale. The $150,000 price tag was steep, but with donations, personal loans, and a $50,000 mortgage from the owner, they were able to buy it. The Insight Meditation Society (IMS) was established on Feb. 14, 1976—St. Valentine’s Day. There was no model for what they were doing. “It was the first time there was a center, as far as I know, that was founded and run by Westerners without that singular Asian figure either here or back in Asia,” Salzberg says. Salzberg teaching on “Real Love” at Brooklyn Yoga School. “I had never been so happy,” she says of learning metta practice. Photo by Fabio Fillippi. It was a time of excitement—and debate. Even the word “metta,” which adorns the doorway at IMS, was a source of controversy. Some people thought they should use an English word, like loving-kindness. “In the end, it just stayed,” says Salzberg, and today metta is a recognized term in the Western spiritual vocabulary. There was no programming scheduled for the first month of IMS’s existence, so Salzberg decided to immerse herself in metta practice, something she had only done before as a ceremonial ending to retreats. As IMS’s reputation flourished, so did Salzberg’s reputation as a teacher. Her own growth was kick-started once again by Burmese teacher Sayadaw U Pandita in the late 1980s. By this time, Salzberg had been meditating for almost two decades. She felt free from much of her childhood grief, had come to know her own suffering and that of others, and thought she knew the power of love and compassion. “You can’t fail at meditation,” Salzberg tells ABC News anchor Dan Harris, author of 10% Happier, in a panel discussion cosponsored by the Lion’s Roar Foundation. Read the whole discussion. Video capture by Edward Boyce. But during a retreat in Australia, Salzberg felt something shift, and the traumatic memory of her mother’s death arose. She fell into despair and panic and went to talk to U Pandita about it. He simply told her to be “mindful of the pain.” Though she tried, she knew she was still recoiling from facing her suffering head-on. One night, under a starry sky, Salzberg once again thought of her beloved Dipa Ma, and how she had found faith and love even in anguish. “I thought that if such extreme suffering could serve as the proximate cause of faith, then the suffering of my own despair must also contain a crack of light,” she writes. Under U Pandita’s skillful direction, Salzberg began to see this chapter of her practice as a process through pain, one that could expose her vulnerability on a deeper level. “I think Dipa Ma was right. It’s good for a teacher, certainly a Western teacher, to have been through a lot, because you really understand a lot of things,” Salzberg says. She saw that her suffering could serve as a connection to others, and she began recover a sense of purpose, working to free her mind for the sake of all beings. 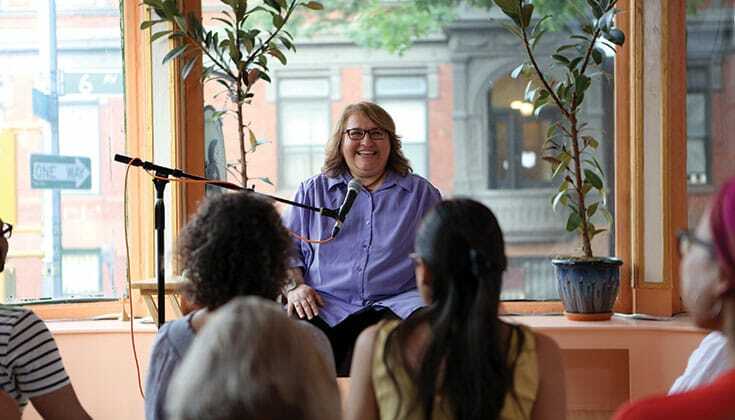 Today, Sharon Salzberg is an established speaker, an author of many bestselling books, and one of the foremost Buddhist figures in North America. She says those attracted to her teachings often feel a connection to her knowledge of suffering. Salzberg says that through meditation practice we can learn to regard suffering as a way to see more deeply, to get to know ourselves better, and to discern what really makes us happy. 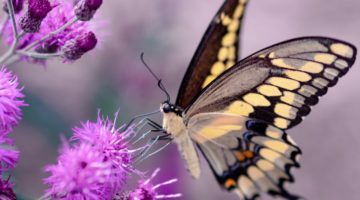 “Why suffer unnecessarily,” she asks, “if it’s distorted thinking that’s bringing forth that feeling?” In becoming more aware of our suffering, she explains, we also discover that there is always an intact place within us, an open space of awareness that can bear anything without becoming damaged. We realize that we needn’t be paralyzed by suffering. “We can emerge from whatever suffering we encounter, not broken and embittered, but with an ever-replenishing wellspring of unwavering faith,” Salzberg writes. If anyone knows the truth of these words, it’s Sharon Salzberg, for facing her own deep suffering that has been the key to her life of connection, community, and self-compassion—and to teachings that have helped many people face and learn from their own suffering as well.